This was written by my 14 year old daughter, who just finished her first year of high school. If there is one thing I learned from doing Philosophy Adventure, it would be this: open your mind to different ways of thinking and you may pick up a thing or two along the way, or respectfully agree to disagree. Quotes like “You can never step into the same river twice” by Heraclitus, can be so simple, yet really get you thinking. My favorite philosopher I learned about would have to be Heraclitus for his witty play on words. Though, some of what he said was confusing, like his writing piece Pithy Prose, which was written in a matter that only very intelligent people could understand it; all of what he said made you think and take things into a new perspective. Walking away from this after a year, I can safely say this was my favorite subject in ninth grade and I wasn’t expecting that. I mentioned that I learned to open my mind to other ways of thinking and personally for me, that means thinking about time in relation to space, thinking about the future, and, overall, my point of view on life. My philosophy is this: that everyone you meet and everything you learn will shape you as a person. In Philosophy Adventure I met eight philosophers who taught me things I will probably even use 10 years from now. Aside from learning about philosophers, their backgrounds, and what their philosophy was, every other page in a lesson had a section that taught me a little more about writing, thinking, and the philosopher’s worldview v.s. the Biblical view. I found the homework pages and tests to be easy to do independently and not too challenging. Each of the 8 philosopher sections studied had a creative writing segment that I loved. The curriculum came with a schedule that was fairly easy to follow, not giving too much work per-day, and by the second semester I doubled up so I could finish earlier and I didn’t find that too overwhelming. 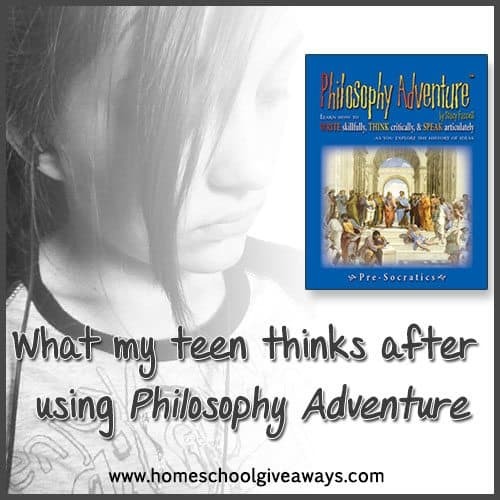 Would you like to use Philosophy Adventure in YOUR homeschool? I gave her 1.5 credits for using this curriculum. You can actually earn 2 full credits, but we didn’t do the “speech” portion enough to gain .5 credit for it. She much rather preferred for me to just read her writing, and I was totally fine with that. The sample here explains high school credits. 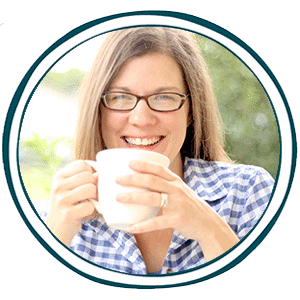 You can also preview Cathy Duffy’s review here.